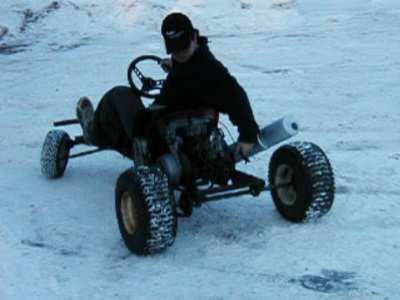 "Our Gokart started as an idea, some free plans from www.mkx.com and a free 5hp engine. The engine needed a coil, so I traded it in exchange for some work on my Jeep. After drawing the MKX plans out on the floor of the shop with chalk, we decided that this was a kart for little kids, and not my 6'2, 215lb carcass. We extended the frame a little bit and widened it slightly. 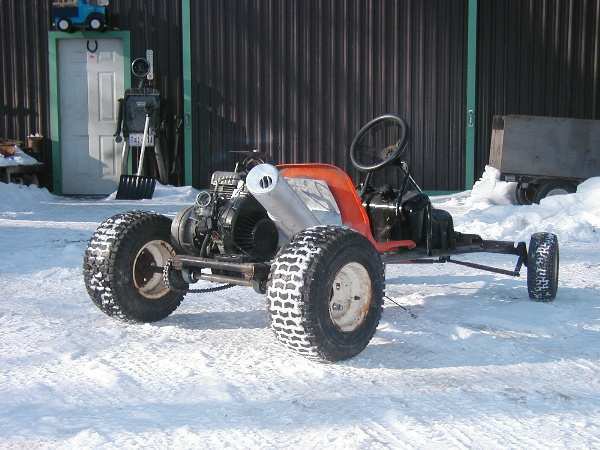 Coincidentally, the track on my snowmobile had given up the ghost at the same time, so its 30hp, 2-stroke engine got put in the design. Some parts of our kart were not built by us. Why re-invent the wheel? These items are mainly in the steering components of our chassis. 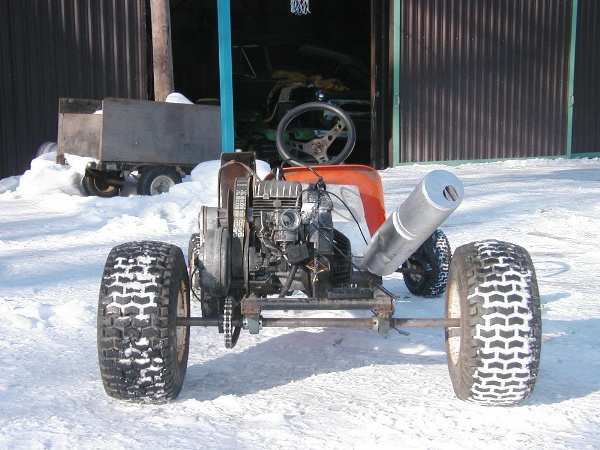 The steering shaft as well as the upper and lower supports were salvaged from a 1969 Skidoo Olympique. The steering spindles and 'knuckles' were swiped from an old ride-on garden tractor, as were all four wheels. 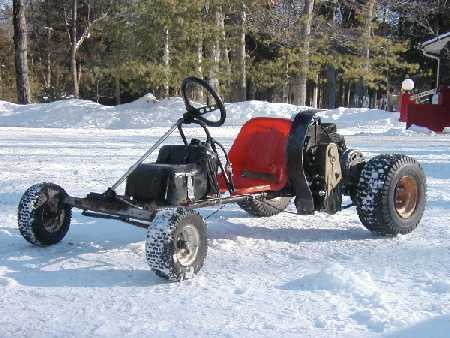 The Frame of our kart is extra 1¼" natural gas line welded together to form a crude 2-rung "ladder". The frame was then joined at the rear by another cross member, and also at the front by a full length cross member. ** The steering 'knuckles' are welded to the front cross member using a special welding technique used for welding cast iron, and '7018' welding rod. **"
Primary and secondary clutches, as well as the chaincase from the snowmobile, with a sprocket welded onto the lower chaincase shaft, thus running #41 chain to a sprocket welded onto the rear axle. Steering System: Support hoop and shaft from 1969 Skidoo Snowmobile, spindles and related accessories are from a worn out lawn tractor. Tires: Large Lawn Tractor tires. Download a Video of Scotty doing a "Donut" in this kart (4mb QuickTime)! Here are the Photos of Scottys Off-Road Kart for the moment. Hopefully I will get a chance to add in some information to go with these photos.